Making music is one of the joys in life. Singing or playing can take your cares away, fill you with happiness and build friendships. They say that music is the universal language that bridges international boundaries. Using one of the top 10 best electronic keyboards in 2019 is one way to bring a little joy or happiness in your or someone else’s life. These instruments are packed full of features to help you develop your musical talent, display your ability and be creative musically. If you are not sure which electronic keyboard made our top 10 best list, just continue to read our review. 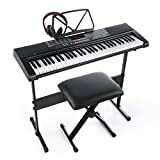 It is filled with interesting information and lets you know which keyboards are the top 10 best electronic keyboards in 2019. You know that regular pianos can be way too expensive to purchase and certainly won’t fit into your monthly budget. 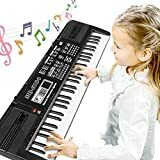 After some consideration, you decide that teaching your children a little piano can be done through an inexpensive electronic keyboard. Like all products, there is good and bad for purchasing one. This is a good unit to help young learners understand and learn how to play the piano. There are only 61 keys for them to hit and only 1 pedal to think about using. The LCD display screen makes sure your young learner knows where they are at. What functions they are using and so on. This may be a beginner’s keyboard, but it is still packed with features. You get to record and playback functions, 100 keyboard sounds, 100 rhythms, and 30 demo songs to learn from. The sole pedal is the sustain pedal, allowing your child to learn how to use it right. This keyboard is a little smaller with only 54 keys to play. But it still has the display screen to keep you focused on what you are doing and gives you the correct keys to play. The control panel is easy to reach and use. You do not lose time trying to make adjustments on the fly. There is no pedal to use with this keyboard. That makes playing a little easier. You only get 8 demo songs to learn, while using 100 keyboard sounds and another 100 rhythms. This keyboard also comes with built-in stereo speakers, so you can experience the full piano effect. It is a great teaching keyboard as it brings the piano to young learners in stages. A music rest lets you read your own music and play at the same time. 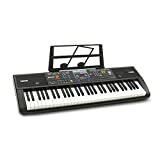 Casio makes some fine keyboards and this 46 key unit is perfect for the novice piano player. The young learner can follow the notes to play that appear on the LCD display screen. Also, they have the option to use up to 100 sounds with 50 rhythms. Measuring 18.5 x 9 x 2.7 inches, all the buttons on the control panel are within easy reach. You can alter your sound even as you play. Its small size makes it a perfect keyboard for traveling or small apartments. You can sing along as your young learner plays. This electronic keyboard comes with its own microphone. Along with headphones, this keyboard comes with built-in speakers to sound like a real piano. Also, this keyboard is loaded with features. You get over 250 keyboard sounds, over 250 rhythms and 61 percussion options to choose from. The LCD display screen clearly displays your functions and notes so you do not get lost while you play. Record and playback features are also a part of this unit. Your young learner can learn from their mistakes as they listen to themselves play. A padded stool makes playing a lot more comfortable and is included with your purchase of this keyboard. The USB compatibility opens up new options as you learn how to play or use this keyboard. You can record what you are playing and play it back later through the MP3 function to see if you have improved at all. Until you do that you can practice with the over 250 keyboard sounds, the over 250 rhythms until you have your sound right. You can also practice and learn from the 50 demonstration songs included in the software. The LED display screen is there to help you hit those correct notes. 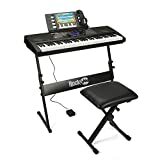 The music stand, padded stool, adapter, and headphones are all included so you have no excuse to practice and get better. The control panel is easy to use and not difficult to understand. A great little keyboard for little kids who want to learn to play or already know how to play. Measuring 21 by 10 by 4 inches approx. this keyboard will fit anywhere in your home. It is also made from non-toxic and very safe plastic. With 61 keys to use, your kid can experiment with the 16 keyboard sounds, 8 percussion options and the 10 rhythms that are available on this keyboard. Plus, they can learn from their mistakes through the record and playback function available. All the buttons your child needs to use are easily accessed and right by the keys. An LCD screen shows what notes they need to play next. There is only one built-in speaker and the included microphone is not real. When you can’t afford a real piano for your kids to practice on. This 61-key keyboard can fill the gap and help your kids improve their musical talent. A USB port is included allowing you or your child to play their MP3 files through the built-in speaker system. Power is brought to the keyboard through either the adapter or 6 AA batteries, not included. Once the keyboard has power, your child can access the 40 keyboard sounds, the 100 rhythms, the 8 percussion options with little trouble. All the buttons are right there on the easy to use control panel. The buttons are colored coded for easier use. 60 demo songs are also included on this 34 x 12 x 3.5” keyboard. All the sounds of a regular piano can be found in this little 61 key electronic keyboard. The LED display screen sits in the middle of the control panel. This provides a clear view of the correct notes to play and all the features you are using. Along with the display screen, you get 3 teaching modes to help young learners improve. 60 demo songs to help them learn, 300 keyboard sounds and 300 rhythms are also included in the package. To help them learn from their mistakes, there is a record and playback function. A USB port, a headphone jack, and a microphone jack are already installed. An adapter or 6 D cell batteries bring the power this keyboard needs to work. You can connect this 61-key keyboard to your iOS or Android phone to download more music apps. These apps help you or your young learner grasp piano playing a lot easier. The unique feature of this keyboard is that the keys light up when it is their turn to be played. The adapter brings the power and once charge your young learner has access t over 450 keyboard sounds, over 250 rhythms, and 65 demo songs. Learning how to play the piano has never been so easy. 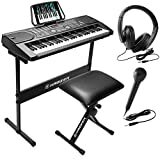 Keyboard stand, music stand, padded stool, headphones, and adapter all included in this set. There is no excuse for not sitting down to learn how to play the piano. Also, you get access to 300 tones, 300 rhythms, and 40 demo songs when you plug this unit in. The control panel is easy to understand and use as well. You can alter your sound by listening to yourself play with the play record and playback function. 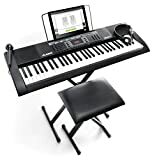 When you purchase this keyboard set, you get the keyboard stand, padded stool, music stand, headphones, microphone, and the adapter. Everything you need is in one box. Develop their sense of rhythm– and other musical talents they may have hiding in them. They can also learn how to write music and songs as they grow older. Learn how to become good– instead of thinking they are good, they learn that a lot of practice is needed to actually be good. Learn the value of hard work– this is another life lesson that will help them get ahead in life. They will see that if they work hard and smart, they can be successful. These electronic keyboards may not be real pianos but that doesn’t matter. They are still good tools to use to teach your young learners important life lessons and how to play the piano well. 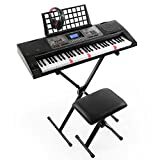 Choosing to use one of the top 10 best electronic keyboards in 2019 is the way to give your young learner an advantage over their friends. They can develop their creativity, their musical ability and have access to many more sound options than other instruments. Plus, their learning experience will be more fun than using a regular piano. They can record their work, listen to it later and make corrections or adaptions. That is a great way for them to take a better interest in music lessons.